An over-the-counter sleep aid proves to be just as effective as it claims. Everyone occasionally has trouble sleeping. For minor sleep difficulties, we search for over-the-counter medicines to help us get a good night’s rest. However, is an over-the-counter sleep aid really effective? A new study reveals good news for people who wish to sleep better at night. ZzzQuil is an over-the-counter sleep aid made up of diphenhydramine HCL (DPH), which is a type of pharmaceutical drug known as an antihistamine. Zzzquil has been available to the public as a nonprescription drug since 2012, and comes in both liquid and liquicap forms. The medicine is primarily used to treat allergic symptoms, the common cold, insomnia, and also extrapyramidal symptoms – a drug-induced movement disorder. Due to the drug’s sedative properties, it has been used as an effective sleep-aid for years, as well as a substitute local anesthetic for those who are allergic to lidocaine. Thomas Roth, Ph.D., director of the Sleep Disorder and Research Center at Henry Ford Hospital in Detroit, along with his team of researchers, sought to determine the benefits of sleep-aids such as ZzzQuil. “This study demonstrates that diphenhydramine HCI can provide benefit to people who sometimes need help getting a good night’s sleep,” said Roth. In order to prove their theory, Roth and his researchers gathered 33 people, average age of 40. The researchers analyzed the effectiveness of DHP, versus a placebo, in order to find out if the drug had any impact on sleep. Results were positive. On average, the test subjects fell asleep 8 minutes faster with DHP versus using the placebo, meaning they were able to fall asleep in less than 20 minutes. They also stayed asleep longer, leading to better quality sleep. This is good news for those who suffer from sleep occurrences, which is described as having trouble sleeping for more than two nights in a row, and taking more than 30 minutes to fall asleep. It is also positive news for those who deal with sleep disorders such as insomnia. A lack a sleep can lead to stress, anxiety, depression, asthma, diabetes, and other conditions. An over-the-counter sleep aid may be what some people need to sleep through the night. Even though it is not as common as obstructive sleep apnea (OSA), central sleep apnea (CSA) is still a problem for many people. New research shows that scientists are one step closer to solving the problem of CSA and sleep-disordered breathing. Central sleep apnea (CSA) is a sleep-related disorder that affects an individual’s breathing. The disorder occurs when the brain fails to send signals to the body—signals that tell the vital muscles used in breathing to work during sleep. Daytime lapses that turn into sleep. The new study, performed by the University of Edinburgh’s Centre of Integrative Physiology, found key information about the signals that regulate breathing during sleep. These signals are important, especially during times where oxygen levels are low. In order to find a solution to treating central sleep apnea, scientist looked into an enzyme called AMPK. The AMPK enzyme helps people breathe faster when their availability of oxygen is low. Using genetically modified mice that were not treated with the AMPK enzyme, the study was able to determine that the mice showed similar symptoms to people with central sleep apnea. We’ve talked before about how brain function tends to decline at a faster rate in those who suffer from hearing impairment. However, there might be a solution for protecting people with hearing issues from suffering anymore. A new study shows that the brain functions – particularly memory and speech – can be improved by wearing hearing aids. Untreated hearing loss can make brain functionality worsen over time. The reason: those with a hearing impairment who don’t wear hearing aids have to work twice as hard to understand what others are saying. “You may actually be using the majority of your cognitive resources – your brain power – in order to figure out that message,” says Jamie Desjardins, Ph.D., an assistant professor in the speech-language pathology program at The University of Texas at El Paso. Dr. Desjardins, who led the new study, explains that hearing loss affects more than 9 million Americans over the age of 65 and 10 million Americans ages 45 to 64. However, only about 20 percent of people who actually need hearing aids wear them. How Do Hearing Aids Help Improve Memory and Speech? Dr. Desjardins’ study is a comparative one, focusing on Hispanics in their 50s and 60s with bilateral sensorineural hearing loss who had previously never worn hearing aids. The study tested the participants’ cognitive abilities, before and after they started using hearing aids. The study’s findings are of great importance to those suffering from hearing impairments. After two weeks of using hearing aids, the tests showed that all of the affected cognitive abilities improved, including recalling words in working memory, selective attention, and processing speed abilities. Attention and ability to process things with some speed. Why is an improvement in these abilities significant? “Think about somebody who is still working and they’re not wearing hearing aids and they are spending so much of their brainpower just trying to focus on listening. They may not be able to perform their job as well. Or if they can, they’re exhausted because they are working so much harder. They are more tired at the end of the day and it’s a lot more taxing. It affects their quality of life” Desjardins explained. When you eat better, do you find that you sleep better? There may be a connection between sleep and diet. A new study found that eating more fiber, cutting back on saturated fat, and reducing sugar intake can be associated with deeper, more restorative, and less disrupted sleep. Results show that greater fiber intake tended to result in more time spent in the stage of deep, slow-wave sleep. In contrast, a higher percentage of energy derived from saturated fat meant lighter slow-wave sleep. More arousals from sleep took place when greater sugar was consumed during waking hours. The study also found that after eating fixed meals prepared by a nutritionist, which were lower in saturated fat and higher in protein than self-selected meals, participants feel asleep faster. It took participants an average of 29 minutes to fall asleep after consuming foods and beverages of their choice, as opposed to 17 minutes to fall asleep after eating controlled meals. Twenty-six adults took place in the randomized, cross-over study, evenly divided between men and women. The adults had a normal weight and an average age of 35 years. Participants spent 9 hours in bed from 10 p.m. to 7 a.m. for 5 nights in a sleep lab, sleeping for 7 hours and 35 minutes on average per night. Objective sleep data were gathered nightly by polysomnography, a diagnostic tool in sleep medicine. Sleep data were analyzed from night 3, after 3 days of controlled feeding, and night 5, after one day of when study subjects consumed food of their choice. Study results are published in the January issue of the Journal of Clinical Sleep Medicine. The study suggests that dietary suggestions and changes might help improve sleep in people with poor sleep quality. However, additional studies are needed to assess and confirm this relationship. 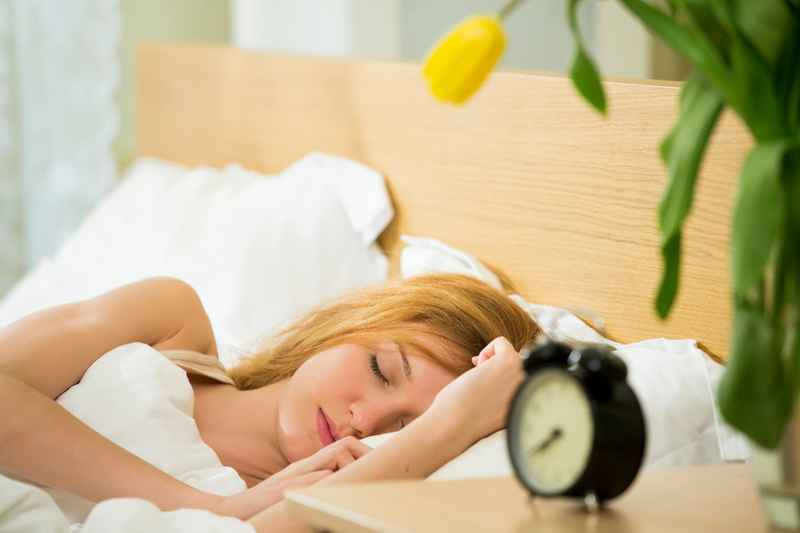 There are countless reasons why a person might not be able to properly sleep at night. Anxiety, stress, difficulty breathing, and physical pain are only a few of the many obstacles that can prevent the brain from shutting down alpha activity and preparing for REM sleep, and for some it can feel impossible to go to sleep. Although there are varied treatments that scientists and doctors have developed – from physical exercises throughout the day to sleep aids and other medications – many are unwilling, or simply unable, to receive these treatments for one reason or another. Many of them turn to home remedies, with alcohol among the most used. Using alcohol as a sleep aid has been given as prevalent advice from many societies for hundreds – or even thousands – of years. Alcohol is seen by many as having a positive effect on helping the restless go to sleep faster, and though this seems to initially be the case for those who consume alcohol before sleep, new research has confirmed that alcohol also causes disturbances while the person is asleep. “People likely tend to focus on the commonly reported sedative properties of alcohol, which is reflected in shorter times to fall asleep, particularly in adults, rather than the sleep disruption that occurs later in the night,” said Christian L. Nicholas, of the University of Melbourne, who was one of the researchers who looked at the effects of alcohol on the brain before and during sleep. Those using alcohol as a sleep aid may think it is helping counter-act their restlessness, but in fact it may be adding to it. The team’s study included 24 healthy people, 12 men and 12 women, from the ages of 18 to 21 years old and who socially drank (with less than seven standard drinks consumed per week in the month leading up to the study). They engaged in pre-sleep alcohol activities as well as placebos, and their brains were measured for delta frequency electroencephalogram (EEG) activity of Slow Wave Sleep (SWS), which helps promote restful sleep, as well as frontal alpha power, which is associated with wakeful states of the brain. The results from all participants were an increase in both EEG activity as well as frontal alpha power. This explains why alcohol initially seems to promote restful sleep, with the increase of the EEG activity, and also explains why so many report either sleep disturbances throughout the night or a lack of restful rejuvenation from the hours they do sleep. “Similar increases in alpha-delta activity, which are associated with poor or unrefreshing sleep and daytime function, have been observed in individuals with chronic pain conditions,” Nicholas said, adding that this study confirms that alcohol is not a sleep aid. The additional sleep that someone may get from pre-sleep alcohol consumption is disturbed and altered because of the alcohol, negating any positive effects. The best way to fight restlessness is to consult a sleep specialist, or at the very least a physician, who can recommend cheap-to-free alternatives to alcohol consumption to get your needed rest at night. Sleep apnea has long been the focus of study. One reason for this attention comes from the fact that the disorder is linked to numerous other conditions. For example, commonly known health risks tied to sleep apnea include heart disease, obesity, and diabetes. However, the latest research indicates that the health risks associated with sleep apnea include stroke and cancer. These studies suggest something even more troubling: A sleep apnea death risk. In fact, the evidence increasingly suggests that death rates are considerably higher when sleep apnea is involved. When it comes to health and quality of life, sleep is fundamental. For, as Macbeth says, it is “Sleep that knits up the raveled sleave of care.” Sleep apnea not only interrupts this vital function, where mind and body are healed, but it can be a catalyst for developing other serious conditions. Moreover, sleep apnea affects a sizable number of the population. Men seem to develop the condition more often than women, with 7% of the male population presenting with sleep apnea. Unfortunately, women are not that far behind, with 5% reporting as having sleep apnea. After conducting a 20-year study, researchers found that mortality rates are dramatically increased when a person has sleep apnea. The rates were the highest when sleep apnea was moderate to severe. Strokes, for example, are nearly 4 times more likely to happen to a person suffering from sleep apnea, than for those who do not have the condition. The risk of cancer was also more likely in patients with sleep apnea. In fact, the study showed that a person with sleep apnea was 3 times more likely to develop cancer. Moreover, based on this study, the chances of a person with sleep apnea dying from a stroke or cancer is approximately 3 times higher–compared to someone who has a stroke or cancer but does not have sleep apnea! Obviously, a sleep apnea death risk is not something to be taken lightly. However, the good news is that there are treatments for sleep apnea. Of course, researchers are always working to develop better alternatives to what is available, but current therapies are quite effective for reducing risks and slowing the progression of sleep apnea. Getting treatment for sleep apnea, means giving oneself a better chance of avoiding some of the risks associated with it. Which Ear Do You Use When Taking a Call? Really, it is your brain that makes the decision rather than which ear you favor or which hand you prefer to hold your phone with. The reason is because of the way that your ears connect to your brain. Believe it or not, the speech center of the brain can be on either side. The fact is, however, for nearly 19 out of 20 of us, this is on the left side. Brain hemispheres coordinate with the opposite side of the body. This accounts for why the majority of people are both right handed and talk with the phone held up to their right ear. Researchers intend to use this information in a number of ways. For example, for many years, there have been concerns over the connection between cell phone use and brain tumors. Since the majority of people hold cell phones to their right ear, you would expect more brain tumors to be focused on that side. So far, researchers are seeing that the only factor that really connects cell phone use and brain tumors is the sheer amount of phone use. Neck cancer does not seem to be related to cell phone use. Another phenomenon that researchers are looking into is the fact that people use their right hand as well as their right ear. For a right handed person, this seems to make little sense, since they are tying up their dominant hand, which could be used for note-taking or other activities. 5,000 individuals were a part of a study that involved cell phone use and which side of the brain a person’s speech center was on. The individuals were already undergoing tests to determine the location of their speech center for one reason or another. The results were then compared to a survey in which individuals revealed which ear they usually hold their phone to. In the study, 68% percent of people who favored their right hand also favored their right ear for phone calls. For lefties, 72% stuck to their dominant side. The study didn’t just show that a person wanted to use their dominant hand, but that they wanted to use the ear the correlated with the dominant side of their brain. Sleep apnea is a dangerously growing trend. It’s often accompanied by other complications involving—but not limited to—cardiac disease, obesity, stroke, and high blood pressure. Potential issues during surgery are also likelier when a patient suffers from sleep apnea. Studies, however, have found that the risks associated with sleep apnea and surgery can be reduced by using different types of anesthesia. Nearly 25% of surgical patients suffer from sleep apnea, so this news may have a huge impact on the state of surgical medicine. A patient with sleep apnea can have their breathing stop up to 30 times in an hour, which can pose a serious problem for those undergoing surgeries like joint replacement. Where local anesthesia numbs a localized portion of the body, general anesthesia puts a person into a sleep-like state. This is where the danger lies for sleep apnea sufferers, whose breathing can suddenly stop during surgery. In an effort to see what could be done about this, a team of medical researchers decided to try a different approach when performing a joint replacement on someone with sleep apnea. Instead of using general anesthesia, they applied local anesthesia instead. The injected local anesthesia seemed to have been just as effective as the general one. Complications during surgery were also less frequent with the regional anesthetic. Researchers are confident that this principle can be applied to other surgeries, as well. Using a regional anesthesia instead of a general one could potentially change how surgery is performed on sleep apnea patients. Studies have been conducted to see how different types of anesthesia affect surgeries on sleep apnea patients. Of these, some have shown as much as a 17% reduction in intrasurgical complications. In light of these studies, it is hoped that invasive procedures can be performed with less risk to sleep apnea sufferers. Communication is an elaborate process that coordinates a number of functions within the human brain. This carefully choreographed process is what helps us hone speech skills, learn how to play an instrument and hold a conversation with other people. Until recently little was known of the connection within the cerebral processes between the auditory and motor systems. How are these systems connected, and what is the benefit of these newer findings? Whenever a sound is heard, the brain is able to determine whether it was from an outside source or if it was from oneself. This is where movement comes into play. The sounds made from one’s own movements register differently than movement and subsequent sound from another source. The hearing sense being wired to movement is important. Distinguishing where a sound is generated from has great implications for the study in understanding and treating of certain diseases. Recently, the first diagram of these intricate systems and how they interact has been developed. A veritable map of these processes is significant in a number of ways. Careful consideration of these routes shows that the auditory nerves receive copies of motor commands generated by the brain. When a sound is about to be made, the brain is basically preparing itself to receive the sound. A veritable lowering of the volume takes place within the brain when a sound is self-generated. Literally, the brain is quieting its inner voice. This type of close relationship can help scientists explain certain psychosis and other ailments. Certain disorders such as schizophrenia can be better understood and therefore treated in light of this new information. How so? Those suffering certain mental disorders often cannot determine where certain sounds, particularly voices, are coming from. Voices generated in the mind are not quieted and therefore are thought to be from the outside. Understanding the interplay between these processes can help researches pinpoint trouble areas. Further investigation is needed, but researchers are hopeful that future findings will be positive.